Off-road adventures can be for a day, a week, a month… And at some point you need to stop for the night. Options abound for overnight accommodations ranging from a tarp on the ground to roof top tents with changing rooms and a luxuriously padded floor. In between is just about everything else. We decided to test out the Kelty Carport Deluxe Shelter and see how well it would work as a shelter for long off-road adventures. 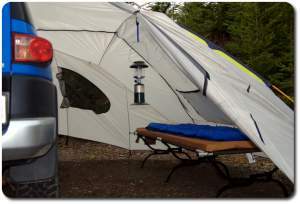 The Kelty Carport can be set up in several configurations. 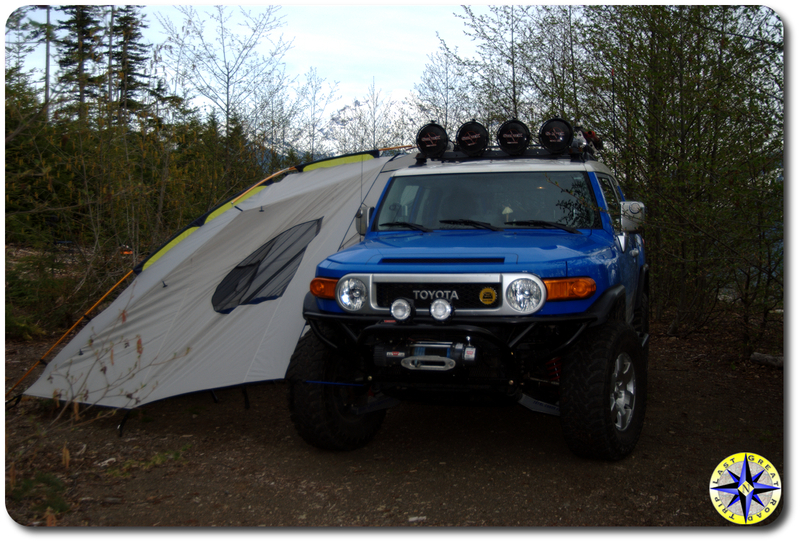 It can function as a car side awning with just a top or as a sided privacy shelter attaching to the rigs roof rack. It can also stand alone as a three sided shelter with the included poles. 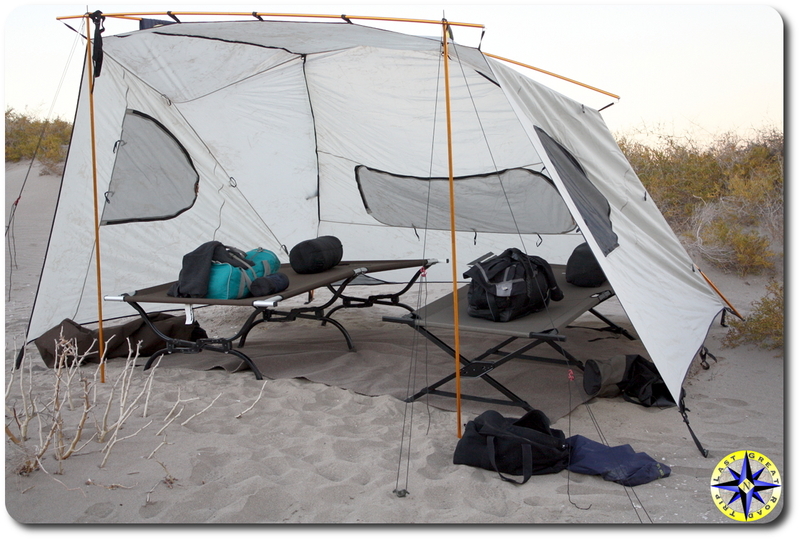 The first thing you notice when setting up the shelter is that you will need to read the directions (not a straight forward setup process). There is an order to things and in this case if you don’t follow Kelty’s order you’ll end up wondering why the shelter seems more difficult than it should be. Set up time averaged about 15 minutes once we knew the right order. The second thing you’ll notice is that everything is an extremely tight fit and you will be stretching and pulling to hook the Polyester taffeta shelter to the aluminum polls. Kelty’s engineers use a lot of tension to keep everything in place. The final issue to overcome is wind… When the atmosphere is less than calm, lifting the shelter to attach it to the rig is a lot like holding a kite in a wind tunnel. Once it is up and the sides all staked down it is stable and protects you from wind. Even in the awning configuration it remained solid although you have to use three tension lines on each of the two polls to keep it standing tall. In either configuration the shelter will keep the rain off, however there is no floor and you will have large gaps at the roof line where the shelter attaches to the roof rack allowing wind to push rain in when it is coming down horizontally. When the shelter is set up, you’ll find a spacious, well ventilated area that protects you from the wind, sun and night time dew point. With the high point of the shelter attached to your rig, there is plenty of standing room in the shelter with the added bonus of full access to your rig. In fact the shelter can be set up with the sides down for full privacy while allowing you to open the doors of the rig providing full access. The ability to keep your gear and cloths stowed in the rig while you sleep in the shelter add to the roominess of your living area. 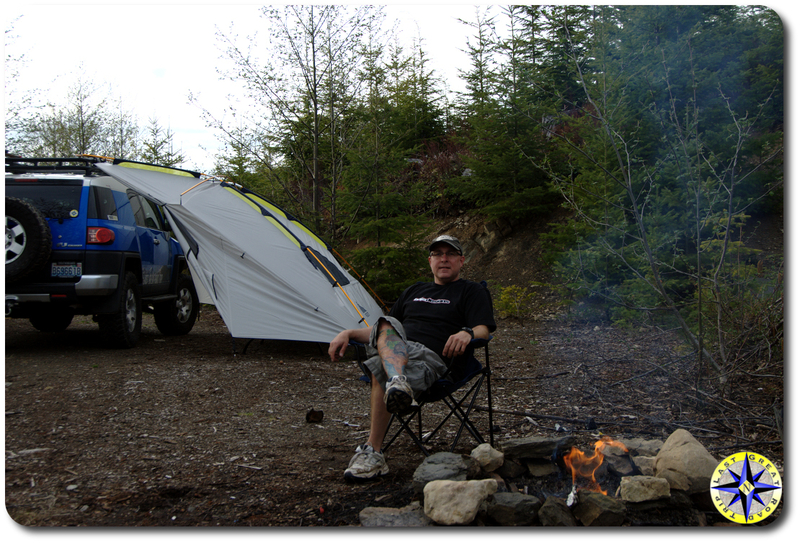 The shelter attaches to your rig with three Velcro straps making it is fairly easy to unhook the shelter, rest it on the ground and drive off for a day on the trail, knowing it will take only seconds to reattach upon your return. We found the Kelty Carport makes a good summer shelter and like that it can be configured as an awning (roll up the sides) or a night time retreat. 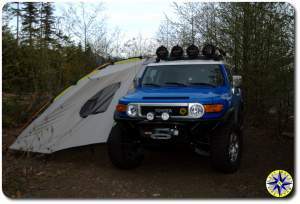 The carport can be attached to the rig or stand alone providing countless configuration options. But setup and tear down takes can be a little challenging for one person. 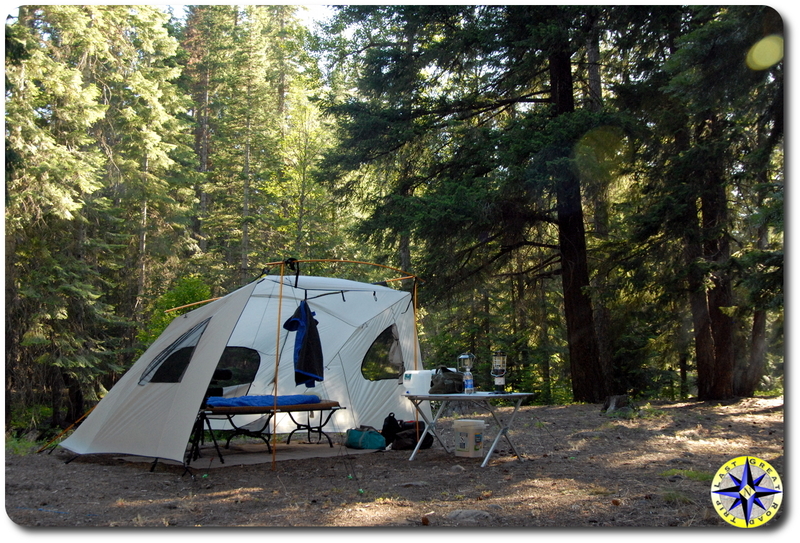 The Kelty Carport is not cheap, retailing for $330. 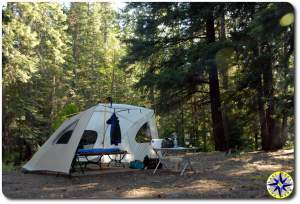 If you like the idea of an awning and want a little more earthiness in your overnight accommodations, consider the Kelty Carport as an option somewhere in the middle of true luxury and bear bones minimalism.